I cannot even begin to describe how cathartic and satisfying it was to hurl a few plates, and even better, experience the impact and sound of a dinner plate hitting a cement wall and shattering into hundreds of pieces. Don’t knock it until you’ve tried it. I have always maintained that the best way to maintain one’s sanity when frustrated is to head into a padded room (or up against a huge pillow) and scream at the top of your lungs to just let out all the bad stuff. Let’s just say it helps to lower the blood pressure, and I have notoriously LOW blood pressure. So a few days ago, as I was going through the restaurant’s inventory and finding large anomalies in recording, I chanced upon two large crates of damaged plates and glasses. After four months of operation, we have understandably nicked, cracked, broken some 5-6 dozen plates, a normal occurrence in the business. I removed them from the stock room, sorted out the ones with just nicked rims and offered them to staff who might want to take them home and use them. They may not have been okay for a restaurant, but 90% found homes with the crew who were happy to take them. I did, however, keep several of the most gravely damaged plates for myself as I wondered out loud what it would be like to smash them against a wall… :) There are places that actually CHARGE you to smash plates against a wall, sometimes you can even put a picture (evil!) of someone or something to serve as your target. I know there is one such place in the hills of Busay in Cebu, and others in Luzon. At any rate, I picked a spot where I had minimal risk of hurting anyone or anything, stood some 20 feet away from the wall, conjured up images of things that needed to to be exorcised and let loose with one of the most powerful pitches I could muster. On the first go, the dinner plate hit the wall almost completely flat, and it shattered BEAUTIFULLY and with such force and sound that I literally felt it and it felt GOOD. Weird in a way, but seriously good. I tried a few more, mostly to get these photos, but the first one was the best. Folks at the office thought I had literally lost my marbles, but before long, a few of them gave it go and they too thought it was extremely satisfying. So just in case you think you are on the edge of losing it, find a safe spot and smash one of those knicked plates you can’t get yourself to throw out, and experience this for yourself! haha.. i remember the TAKSYAPO wall in Tarlac (Isdaan Restaurant)..
Isn’t breaking the dishes a Greek custom, but in this case to show appreciation for a really fine meal? If so, then yes, maybe your resto deserves a lot of broken plates! The plate vendors in Divisoria and Quiapo are only too happy to encourage this trend MM is starting! Nice capture on the opening shot MM! btw, love the Smashing Pumpkins as well. queue “Bullet with Butterfly Wings”……in spite of my rage, I am still just a rat in a cage…. MM, I hope the recording anomalies get sorted out. As for taking out my frustration, I’ve always wanted to try recreating this scene on a movie called ‘Office Space’. It’s a movie about unhappy IT programmers. There’s a scene there where they stole the company’s hated defective printer, took it to a grassy lot and took turns destroying the machine with baseballs bats, kicks and punches. Such a classic. Thanks for reminding me about The Smashing Pumpkings. I was a fan of their songs in the mid to late 90s and your post reminded me that I should look up their songs for my ipod. I hope you were thinking of Citibank, etc. when you were smashing your plates – THAT would really be cathartic! While working overseas, a friend found herself unable to resort to the usual stress management techniques and found recourse in smashing plates inside her flat. But mindful that she had to clean up the mess herself, she first wrapped the plates in thick plastic bags. The Greeks do it all the time !! Cathartic! That first photo says it all – beautiful capture! This is what Aristotle Onassis used to do :) There was a Greek restaurant in Malate (years ago) where you could also pay for a stack to break…but I think it was more a celebratory thing. This is so timely — because I think I need to break a few plates myself right now! I had thought about this for a long while – whew, I can see why it would feel so GOOD!! Hurt no one, but release all the bile from the system. I find this relaxing too. I remember seeing video years ago of the Japanese doing this. They’d put you in a room with a brick wall, you’d tie a bandanna on your forehead, then they’d give you a buttload of plates and even some big fancy-looking vases for you to go and smash against the brick wall, all probably while letting out a fierce scream to purge your stress. 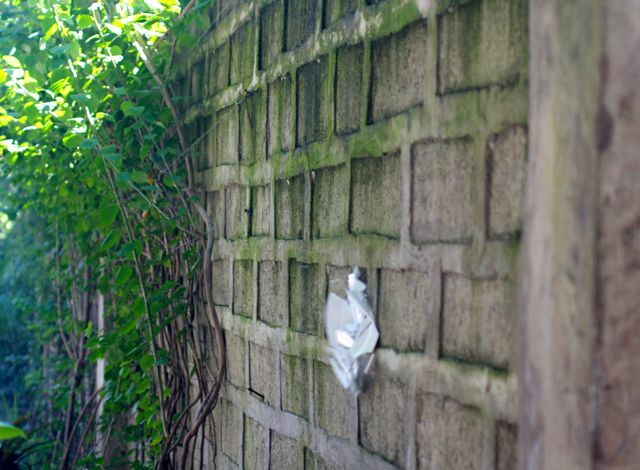 Oppss hubby suggested that MM construct a wall in his outdoor venue where pictures of corrupt politicians are posted and customers can smash plates on their faces! Now that would be the ultimate joy…. You could have a plate smashing wall with entry fee to be given to charity (maybe feeding program). Since restaurants usually figure 30% breakage in one year you could easily have enough chipped plates to use, and you might even get rejects donated by your potter cousin. Luckily plates from China are now so inexpensive that one can easily replace the damaged ones. Always discard chipped plates as they can harbor bacteria not to mention being unsightly. I am always amazed that many folks out there keep serving themselves and others on chipped plates. At the very least one may get injured by the sharp edges. Liked this as a photograph! Great idea! Enjoyed reading the comments from other readers as well. Seems like something we can ALL relate to! The “plates from China are now so inexpensive…” was my favourite! 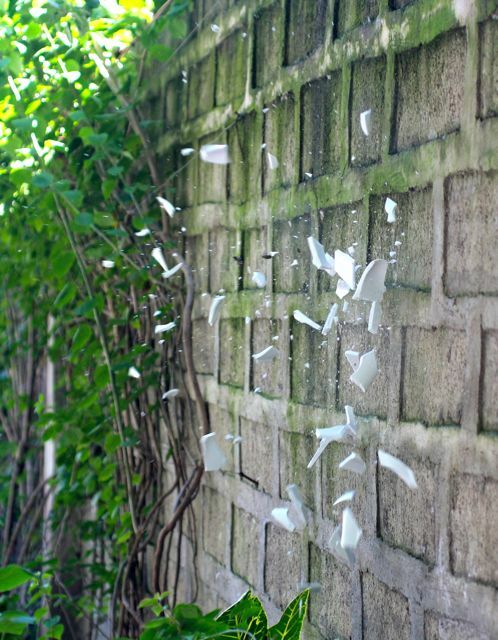 Don’t some cultures smash, break plates during a wedding celebratory ritual, sort of? Jews? Greeks? I used to kick empty cardboard boxes at the back of the old restaurant I used to work at. Let’s just I never lost my cool out on the floor with any customers, I kept my smile and got constantly good tips to pay for my college. Now I just kick bags and kicking pads for fun and fitness! That pumpkin anecdote reminded me of a surreal Halloween I spent in Thailand one year; this American colleague of mine decided to “impress” his Thai friends by first teaching them how to carve jack o’lanterns (out of mini pumpkins) then having them take pot shots at them with a bibi gun. He was getting a bit too enthusiastic about the shooting part until a sizeable pumpkin shard ricocheted and hit him in the eye. We recycle glass bottles over here, MM…so the other day, instead of just dropping it gently, I purposely threw the bottles inside the bin agressively. I figured this is the best place …I need not clean up my mess after!